A map of the oil pipeline. Kampala — Excitement filled Hotel Africana's spacious Nile Hall on January17 as hundreds of local suppliers braced for details about the specifics of the $ 3.55 billion pipeline deal contained in the study about its engineering designs. Houston-based Gulf Interstate Engineering (GIE) carried out the year-long study at $ 11.5 million to guide Total, CNOOC, Tullow, the Uganda National Oil Company (UNOC) and the Tanzania Petroleum Development Corporation (TPDC) on investing in the project. The Africana event, officials said, was intended to share findings of what is technically called the Front End Engineering Designs (FEED) of the pipeline with potential suppliers to help them identify and prepare for business opportunities. But as Mark Lamb, a jovial elderly engineer at GIE delved into what Ugandans are expected to do to partake of the expected billions, gloom permeated the hall. "How ready do you think we are?" Elly Karuhanga, the Chairman of the oil and gas investors lobby--the Uganda Chamber of Mines and Petroleum (UCMP) asked rhetorically. He also noted that that Lamb's presentation had filled Ugandans with fear and that he felt they might not be "field ready." Karuhanga's observation could also be seen in the questions that Lamb received from the Ugandan prospective service providers. "Shall we be allowed to cross to Tanzania to do business there? How are the two countries' standards going to be harmonized? Is it possible for Ugandan service providers to bid beyond Tanzania?" The anxiety is mainly driven by the fact that the portion of the pipeline in Uganda is only about 296km which is about 21 percent of the entire route. The bulk of it, 1,149km is in Tanzania. Given that the whole deal is $ 3.55 billion, if Ugandans were to get deals on only the portion in the country, they would be looking at a paltry $743.5 million. Patrick Odwe, a local service provider feels that this would be unfair given that Uganda is the source of the opportunity--the oil. The pipeline is set to carry oil from fields in Uganda currently being developed. So far, the fields are two--the Total E&P operated Tilenga project in Buliisa and Nwoya Districts and the CNOOC operated Kingfisher project in Hoima District. The Tilenga project will have a processing facility with capacity of up to 190,000 barrels of oil per day and the Kingfisher project, 40,000 barrels of oil per day. These processing facilities will feed into the refinery and the 1,445km pipeline terminating at Chongoleani peninsula near the Tanga Port in Tanzania. It will comprise a buried insulated 24" pipeline with an electrical heat tracing system associated above ground facilities, and a marine storage terminal with export facilities near Tanga. It will start from Kabaale and traverse eight districts including Hoima, Kyakwanzi, Kakumiiro, Mubende, Gomba, Ssembabule, Lwengo and Rakai. It will then enter Tanzania through Mutukula to Chongoleani in Tanga on the Indian Ocean coast. But rather than worry about whether there would be access to deals in Tanzania, Lamb appeared to urge suppliers to concentrate on their core competencies and create a track record. He said the project's codes and standards have been borrowed from best practices around the world to ensure safety of the project and that they will have to be strictly complied with. "Every service provider including suppliers and contractors will be bound by all these regulatory requirements (safety, construction, operation and IFC regulations)," he said, "We don't want to do it fast we want to do it right so the project survives for 25 years." In describing the work packages that may hold interest for Ugandan businesses, Lamb said the project has four tiers of contracts. He said Tier-4 looks at the more technical service suppliers like Halliburton and Schlumberger and Tier-1 is looking at basic supplies like labour, security, field inspections, pipeline, safety, and electrical inspectors. "This is where a lot of opportunity is," Lamb said. About 10,000 people are expected to be employed during the construction phase. "There will be early civil works (building camps, temporary and permanent roads for the pump stations)." About 2.6 million cubic metres of earth will have to be moved, he added and there will be need for portable power generators. There will be temporary fencing, permanent fencing, construction labour, dry land transport, and security along the pipeline. "There will be need for manual, semi-skilled and skilled camp managers, foremen, drivers, supervisors, warehouse managers, equipment operators. This meeting is about business opportunities, so get ready, get ready." Irene Batebe, the Commissioner Midstream Petroleum Department at the Ministry of Energy and Mineral Development explained that the Jan.17 event was intended to point out to Ugandan service providers the available opportunities for investment and supply of goods and services. "In taking forward this project the Ministry would like to emphasize the importance of collaboration and working in partnerships with all stakeholders," Batebe said. As part of this, she noted that the ministry is in the process of putting up a national content policy that will promote participation of Ugandan labour and enterprises in the oil and gas industry. Peninah Aheebwa, the Director technical support services at the Petroleum Authority of Uganda (PAU) in charge of national content also emphasized optimal participation of Ugandans. Over the years, several studies have focused on this. A 2011 study highlighted available opportunities and challenges that would inhibit Ugandans from fully participating in the sector. In 2013, an industry baseline survey done by the international oil companies, assessed 25 of the local industries in Uganda and also identified what they could and could not do. And in 2014, a capacity needs analysis also put in place a workforce skills development strategy and plan and the government was able to set targets for foreign companies. PAU has, as a result of these studies, developed the national supplier data base -a platform where the PAU, the suppliers and the buyers (IOCs) interact. The idea is to increase the local suppliers' visibility, efficiency in the supply chain and create fair competition. So far, the database has 927 companies (both local and foreign registered) and more are expected to register in another window expected to open at the start of March. Ali Ssekatawa, the director Legal at PAU noted that the disclosure of the FEED findings was intended to further help these suppliers weigh their options in the project. On whether Ugandan businesses would get deals in Tanzania, Ssekatawa said the two governments were involved in negotiations with the view of standardizing the local content regulations of the two countries. Aheebwa also noted that the pipeline was a single-integrated project and discussions are ongoing to open it up for service providers to cross borders. Aheebwa even revealed that the government has even ring-fenced services for locals. Aheebwa was referring to the 3-tier procurement process where if an international oil company is not able to get a Ugandan company to do something, the law requires that the foreign company partners with the local company. She advised the local entrepreneurs to look beyond transporting between Mombasa and Tanga to the site. "Look out for foreign firms that are coming into the country," Aheebwa said, "do joint ventures and prepare so the biggest portion of the investments on the project does not leave the country." Lamb offered the same counsel before exiting the podium to head to Tanzania where he was to make a similar presentation. "Don't be fearful to partake in the opportunity," he said, "look at the documents and interpret the information." 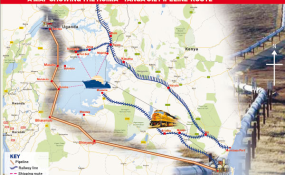 Douglas Evans, the Chairman of GIE described the pipeline route, which Uganda chose in 2016 as the least cost and most robust route, as one of the "world class" projects his firm has recently worked on. "You have an opportunity here and our challenge is to inspire you and explain to you those opportunities so you take them up," Evans said. "But the opportunities are not going to happen overnight, they will take months or even years to develop."